The 2010 National Scout Jamboree is drawing to a close. Tens of thousands of Scouts and Scouters representing every state and twenty nine nations have come together to become friends, share adventures, and affirm their shared sense of values while celebrating the centennial anniversary of Scouting in the United States. Now, as they depart, there is an opportunity to reflect. “A Scout is reverent,” says the final point of the Scout Law. Throughout its history, the Boy Scouts of America has always taught that reverence is an important principle, but the organization does not give strong guidance on how exactly to be reverent. At the jamboree, worship services were conducted for over a dozen mainline spiritual and religious faiths. Quakers and Protestants, Catholics and Buddhists, they all shared something in common at this jamboree. They were joined together to celebrate their own faiths, to find meaning in their lives, and to seek guidance for themselves. It’s awe-inspiring, actually. Such reverence and such diversity all nestled together. History and current events are marred with bloody religious strife throughout the world and even here in the United States. But in our camp at Fort A.P. Hill, we could all worship together, yet faithfully to our own beliefs. Some Scouts even took advantage of the opportunity to attend a service conducted in a tradition other than their own. A Jewish Scout visited Mormon worship with his newfound friends. A Muslim explored Catholic mass. A Methodist participated in a Quaker service. Each was exposed to methods of worship foreign to their own. They were not there to be converted, but they were there to explore, to understand, to respect. By learning the ways of others, the Scouts can reflect on their own faith and why they believe the way they do. It strengthens their faith to be exposed to the diverse faiths of others. A Scout’s practice reverence is much broader than the particular spiritual tradition he chooses to follow. True reverence includes faith, awe, and respect. Faith is one’s pursuit of spiritual belief and understanding. Awe is the sense of wonderment about all that is beautiful and impossible to comprehend. Respect is the acceptance—not just tolerance—that everyone in existence has their own path to walk, but that we can walk all those many paths together. As I reflect on the jamboree, I find that my own reverence has been deepened by what I have witnessed. I have been challenged by friendly Scouters to understand their beliefs, which has helped me fortify what I believe about my own. I am truly awed by the mix and diversity of the people assembled, with such an alignment of positive values (The Scout Law and Oath), and that they exist together in peace. Having seen again how others worship in their varied ways, I find I more profoundly respect that their traditions, rituals, and beliefs are as moving and inspiring to them as mine are to me. Scouts’ reverence isn’t about what they believe spiritually or religiously, rather it is about how they believe. Do they believe in their faith, with awe, and with respect? 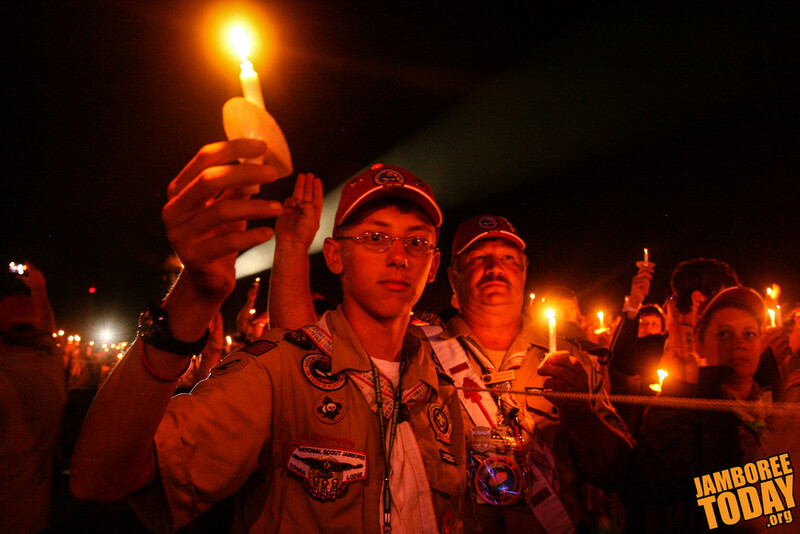 Now, as the National Scout Jamboree closes, we wish and pray and hope that these 45,000 Scouts and Scouters will carry this peaceful reverence home and throughout the world. Throughout the 2010 National Scout Jamboree, I have blogged about Scouting’s main principles as set out in the Scout Motto, Scout Law, and Scout Slogan.